Pin Parvati Trek: The trek of Himachal Pradesh ! 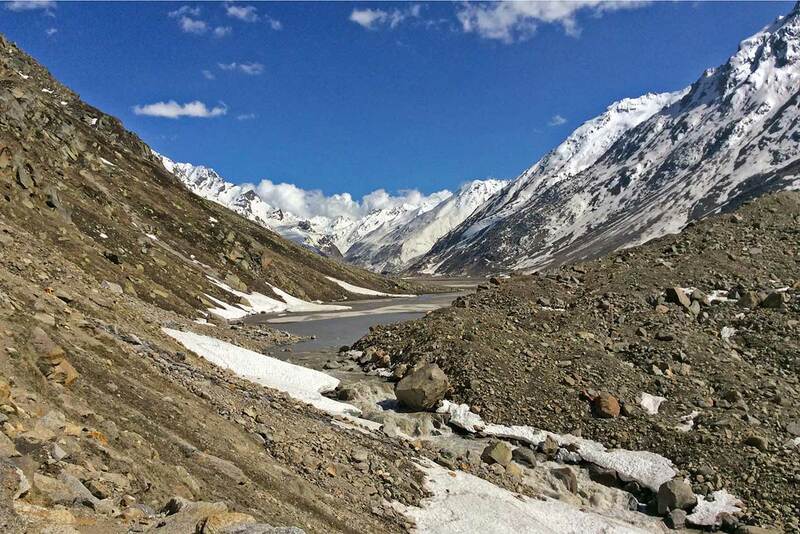 The Pin Parvati Pass connects the Spiti area with the Kullu area via the Pin and Parvati valleys. This trek allows you to go though most of the ecosystems of these two very different areas. Be sure to have a rich and unforgettable experience of the Western Himalayas. the trek is a quite strenuous and so you need to be physically fit. Do not do the Pin Parvati as your first trek as you may encounter difficulties you were not prepared for. 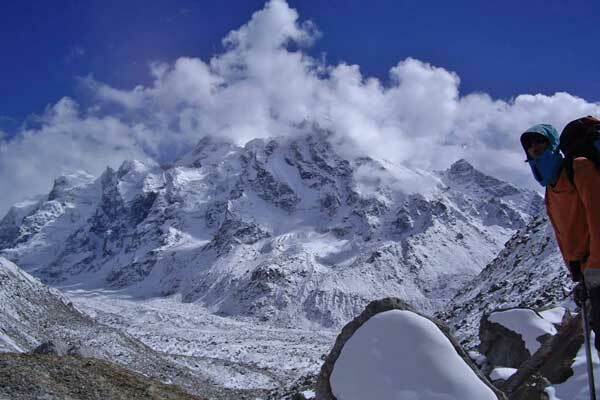 Pin Parvati pass trek is a good challenge for nature lovers and adventure seekers. 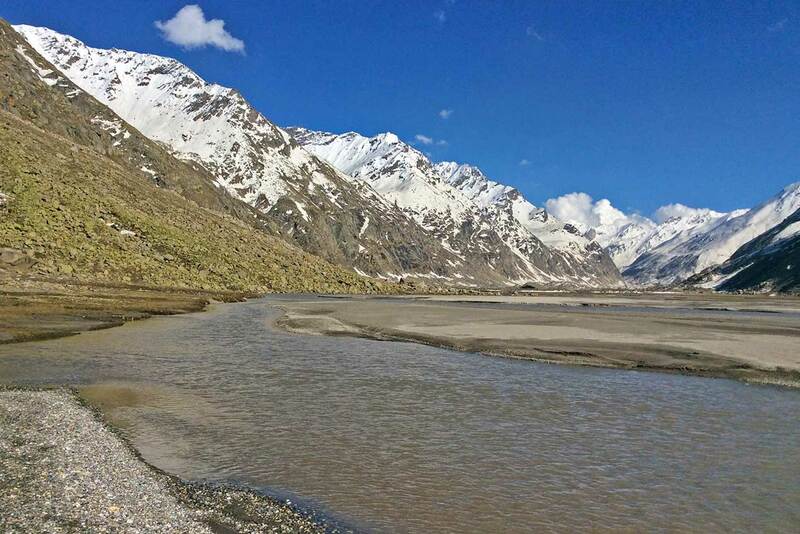 On the second day you will enjoy the hot waters at Kheer Ganga. Then it is a gradual climb through dense forest, large meadows, steep gorges and other glacier-made landscapes. The nature will progressively take the place of the civilization and offer you peace throughout your journey. Except for the first night at Kalgha all other nights are spend under tents on beautiful meadows or on ice near the pass. You will see some incredible landscapes, glaciers and then Buddhist villages in the region of Spiti. The Pin Parvati trek starting from the Kullu side is a long and gentle ascent following the Parvati river upto the Mantalai lake. Shortly after the lake you have a steep climb on a glacier to reach the pass. After the pass you are in the Pin valley in which you descent upto Mud. Best time to trek to Pin Parvati is from end of June to September. You may also consider early June if the snow conditions permit. This is the recommended way : From the Parvati to the Pin valley. Get yourself acclimatized to the Himalayas. Today you have enough time to reach the real trek starting point : Kalgha. We will first reach Barshaini with a vehicle. Then it is only a half an hour walk to Kalgha where you will stay in a homestay. Day 2 From Kalgha to Kheer Ganga. From Kalgha you will start climbing nicely toward Khir Ganga. You will have 4 hours of walk all along the Parvati river. 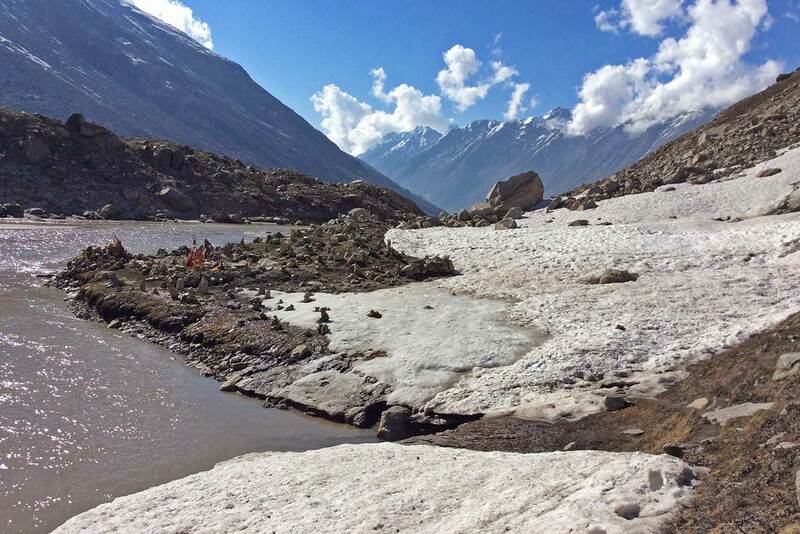 In Kheer Ganga, you can enjoy the natural hot water spring. Night under tents at 2810m. Day 3 From Kheer Ganga to Thunda Bhuj. Shortly after Kheer Ganga you will go through a dense forest of Himalayan Cedar and enjoy the scenic beauty of the valley at this altitude. You will probably meet some villagers grazing their animals in the forest. 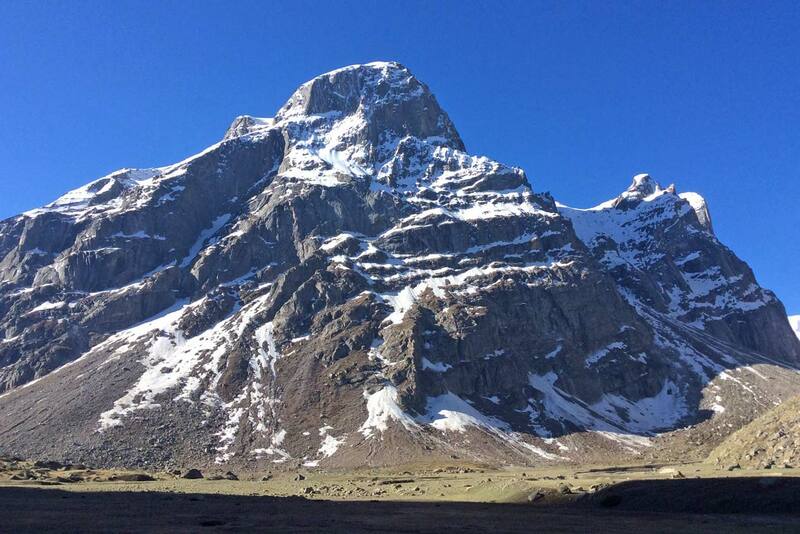 After 5 to 6 hours of walk you will reach Thunda Bhuj. The place is located on a meadow and offers you an incredible view. Night at 3340 m.
Day 4 From Thunda Bhuj to Thakur Kuan. Today the trek to reach Thakur Kuan is quite easy and it will only take 3 to 4 hours the next campsite. You comfortably ascent 250 m today and spend the night at Thakur Kuan. Day 5 From Thakur Kuan to Odi Thach. It is a very exciting day during which you will have to cross 2 bridges to gain your campsite. The first bridge crosses a stream and the second one crosses the Parvati river. You are among Himalayan giants today. You can feel the magic of the higher Himalayas. After 5 hours of walk you will reach Odi Thach. Night at 3800 m.
Day 6 From Odi Thach to Mantalai lake. Today again we follow the Parvati river. As you progress towards the lake you will notice the thousands of smaller streams winding through the bottom of the valley. After 6 hours of walk you will reach the Mantalai lake which collects all the water from the above glaciers to give birth to the Parvati river. Enjoy the scenic view. Night near the lake at 4135 m.
You will leave the lake early in the morning to enjoy the sunrise. The climb of today is pretty steep but it’s worth it! 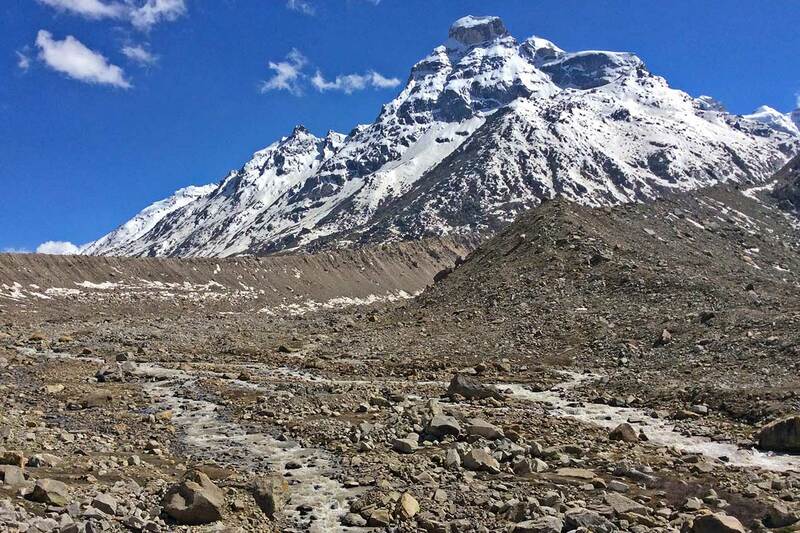 When you will reach the campsite after 7 to 8 hours of trek you will be just at the edge of the Parvati glacier. Night in campsite at around 4940 m.
Today, after a steep climb on a glacier (be aware of the crevasses) you will cross the mighty Pin Parvati pass that connects you with the Spiti Valley. Enjoy the 360 degree view of the Himalayan range and of the higher peaks of the Great Himalayan National Park. Then you have a descent of 1.5 km to reach your campsite. 7 hours of walk today. Night at 4900m. Day 9 From base camp II to Tiya. After leaving your camp you will have a steep descent during 3 km and then the trail follows a stream. After crossing a river, there is your campsite on the other side. 6 hours of walk. Night at 3950m. Day 10 From Tiya to Mud. Today you will walk towards Mud village, after 5 hours you will reach the place. Enjoy the incredible moonscape of Spiti! Night in the Mud village or drive to Kaza. The more you progress the taller are your trek mates ! 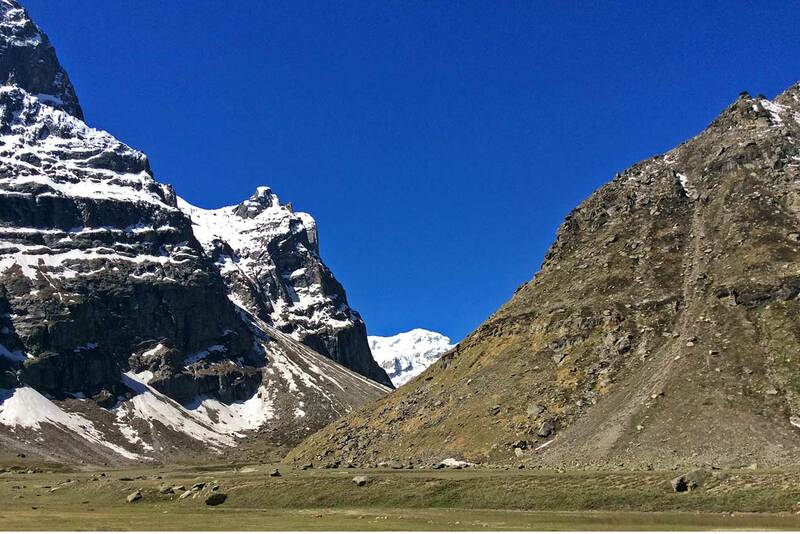 Become accustomed to walking on snow before climbing on the glacier that lies on the pass.